March was a bumper month for Marketing Manchester, as evidenced by the length of this month’s update. The team has been all over the world representing Greater Manchester in our priority markets, and the stories below provide a strong snapshot of the work we do year-round to promote the destination across our visit, meet, invest and study pillars. It’s an understatement to say that this is a time of great uncertainty and there are, of course, huge and valid concerns about the future being voiced from all corners of Greater Manchester about how we move forward. We’ve put Brexit campaigns in place targeting EU and staycation markets to try to mitigate the effects of leaving the European Union, alongside forging ahead to build a stronger hotel market. We’ve been working in partnership and collaboration with a significant number of partners for almost 23 years now (we mark our birthday later this month) and in that time, we’ve undoubtably experienced a rollercoaster of highs and lows, but as a region we’ve been focused for a long time on the bigger picture. That is, our ambition to be a top 20 global city by 2035. In recent years we’ve seen the region thriving and there is an energy and optimism coursing through Greater Manchester giving us all a great deal of confidence to continue to champion our tourism industry, strike major investment deals, and to change our physical infrastructure and landscape across Greater Manchester, notably in the case of Manchester city centre’s skyline. Recent achievements in global rankings reflect this progress, which includes Manchester named 15th best global city by Time Out and being named most liveable UK city in Liveability Index 2018. April is the start of a fresh fiscal year, a time when we commence new projects and push ourselves to think of different and innovative ways to market and promote the region. Going in, we’re confident in our ambitions to continue to build regional, national and international awareness of Greater Manchester. For now, we’d encourage you to read about some of the great activity and groundwork we’ve delivered to keep Greater Manchester top of mind across our visit, meet, invest and study areas. There’s a very special project called Citizens of Manchester that cuts across all these areas – it’s a joy to explore the stories of real people living, working and doing in Greater Manchester, and it is the perfect embodiment of why our global city region is where it is right now. Marketing Manchester has launched an exciting new campaign for 2019/20 that aims to tell the story of the city-region through the extraordinary people who live, learn, work and invest here. Citizens of Manchester – #CitizensofMCR – was launched at the MIPIM international property convention in Cannes, where it featured as the main theme for the Manchester Pavilion. The campaign has its own website – www.citizensofmcr.co.uk – and social media channels, providing a multi-channel opportunity to share the city’s story with the world. Sharing their experience of Manchester via short video character portraits and photography, the #CitizensofMCR include familiar faces as well as those who represent the city’s key brand narratives. The campaign launched with more than 30 video portraits, among them 22 citizens cast to represent key sector strengths and characteristics, including advanced materials, health innovation, music, culture, environmental concern, digital, creative and technology, LGBT+ and sport. They include Corin Bell, hospitality, food and drink sector lead for the Plastic-Free Greater Manchester; double world champion para-cyclist Jon Gildea; Elaine Unegbu, chair of the Greater Manchester Older People’s Network; and graphene scientist Dr Maria Iliut. They also feature in the campaign’s video trailer. The Citizens of Manchester campaign is led by Marketing Manchester’s Manchester Content Curator Simon Donohue, who would like to hear from anyone interested in collaborating. Opportunities include platform sponsorship, live events, partnership campaigns, and funding of CitizensofMCR films to support Corporate Social Responsibility initiatives. One of our biggest annual projects, the Manchester at MIPIM Partnership descended on the international property and investment event in Cannes, France last month for three days of events that saw private and public sector leaders from across Greater Manchester and beyond discussing issues that most directly affect modern cities. Using the aforementioned Citizens of Manchester campaign to shine a spotlight on the people that live, work and invest in the city, the Manchester Pavilion sought to show delegates the human endeavour, engagement and creativity that breathes life into the vast expanse of development opportunities across the city. As a result, the Pavilion was one of the most talked about and striking exhibition spaces and helped draw comment that it was our strongest showing in 20 consecutive years. This year 97 organisations represented Manchester as part of the Manchester at MIPIM Partnership and the event drew thousands of MIPIM delegates to the Pavilion, attending 46 sessions and 19 fringe events with an additional 1,100 from 116 countries tuning in to watch sessions online. The popular European sessions returned, welcoming leading figures from some of Europe’s most exciting growth cities including Brussels, Frankfurt, Vienna, Stockholm, Berlin, Barcelona, Oslo, Hamburg, and Helsinki. A full MIPIM evaluation report will be available in due course. Marketing Manchester and Manchester International Festival (MIF) travelled to New York to launch the official MIF19 programme on 11 March at a special event that also honoured world-leading composer Philip Glass who will showcase a new work Tao of Glass in Manchester in July at MIF. With the draw of Philip Glass in attendance and a fantastic programme announcement packed with major artists from the North American continent, the event welcomed 35 guests; a mix of high-profile journalists from titles such as the New York Post and Forbes, and important travel trade contacts and agents that will promote special packages to attend the festival in Manchester this summer. Follow up will include an invitation for media to attend the festival to write features about Greater Manchester’s thriving cultural offer. In March the Manchester Convention Bureau team hosted two groups of European conference organisers – totalling 18 people – to experience the new Brilliant Science product, part of a Discover England Project led by Marketing Cheshire that aims to extend the visits of delegates attending scientific conferences in Manchester with regional science tours. The activity has already led to two warm leads for new association business. Later in March the Bureau then travelled to Brussels for a series of sales calls with European conference and meetings organisers, again promoting Brilliant Science, followed by attendance at the Association Excellence Awards where the project hosted a Brilliant Science table for key contacts. Representatives from Manchester attended JEC World 2019, in Paris, in early March. With more than 112 participating countries and 27 national pavilions, JEC World, the leading show around composites and advanced materials, gathered the key players of the industry. There were over 1,300 exhibitors and more than 43,500 visitors. The Manchester team met with a variety of different international businesses to discuss R&D opportunities and any relocation plans that they may have. A delegation from Marketing Manchester attended ITB Berlin from 4-8 March. ITB is one of the biggest travel trade shows in the world and Marketing Manchester’s participation was made possible thanks to Discover England funding. At the show the Manchester delegation held 30 meetings where they promoted new bookable product and excursions developed as part of the Manchester: Gateway to the North project. 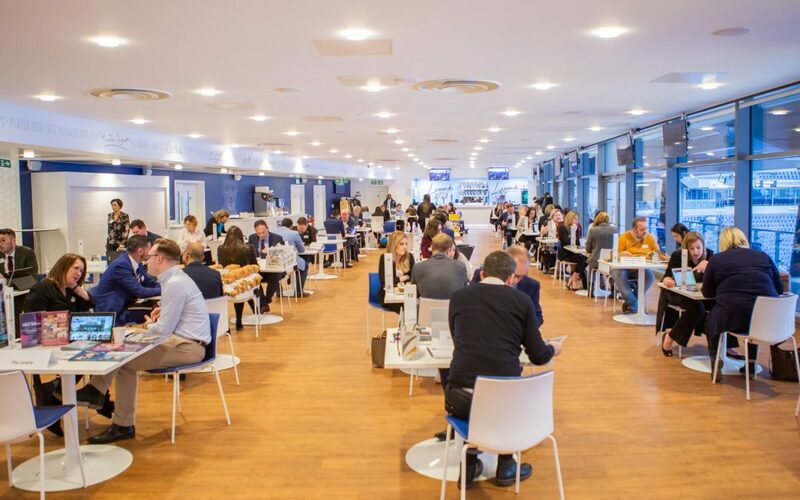 Marketing Manchester recently delivered its biggest ever Manchester Calling, our flagship travel trade event, which included over 500 one-to-one meetings between 29 major tour operators and 39 Marketing Manchester members. Manchester City Football Club hosted at the Etihad Stadium, whilst Virgin Trains and Swans were travel sponsors, with Crowne Plaza & Staybridge Suites – Oxford Road, The Midland and The Principal providing accommodation for some of the buyers who stayed to experience Greater Manchester the next day. Excellent feedback was received from both buyers and suppliers. As part of a piece of work to inspire residents to choose a local day out within the conurbation, Marketing Manchester launched a Greater Manchester-wide campaign in March that highlighted twelve leisure attractions and destinations from around the region that consumers can consider visiting at weekends or during the school holidays. Using the tagline ‘Unmissable Days out in Greater Manchester’, the campaign promoted East Lancashire Railway, Smithills Hall, Bramhall Hall, the Museum of Science and Industry, the Lowry and Dovestone Reservoir amongst others. Last month Lancashire Cricket announced a new partnership with Marketing Manchester, as the Club’s Official Destination Partner. The new agreement will see Marketing Manchester align with Lancashire Cricket’s Principal Partner – Emirates, and Official Hotel Partner – Hilton Garden Inn, to complete a partnership offering that positions Greater Manchester as a global destination, aiming to build awareness, generate increased income and stays in the city and Greater Manchester area. As part of the agreement the Visit Manchester brand has also become the lead partner on the Club’s Royal London One-Day Cup shirt. Speaking about the announcement, Sheona Southern, Managing Director at Marketing Manchester, said: “This is an exciting partnership that will strengthen Greater Manchester’s unequivocal position as a global sporting destination and is perfectly timed ahead of both LCCC’s upcoming 2018 Tour Dubai taking place in one of our key international markets, and the global cricket matches at Emirates Old Trafford this summer. Following on from the announcement, and as partnership privilege, Marketing Manchester was invited to Dubai 16-20 March to join the club on their pre-season tour. This was a fantastic opportunity to create Manchester and north of England content with some of the players to share on visitmanchester.com and social media channels. It was also an opportunity to involve the players with another of our campaigns, ‘Rediscover Manchester’, which is a 13-month Dubai based campaign that was developed in partnership with VisitBritain and with funding from Manchester BID. Marketing Manchester attended the national Cultural Destinations programme conference on 28 March. Funded by Arts Council England, the programme enables arts and culture organisations to increase their reach by working with the tourism sector. The conference brought all 12 Cultural Destinations projects from across England together along with VisitBritain and the Arts Council to discuss progress. Marketing Manchester’s project resulted in new product and itineraries which were completed on 31 March 2019 and we are currently delivering final activity and pulling the evaluation report together. We will share the results of this in a future newsletter. Last month Marketing Manchester, in partnership with Google Digital Garage based on King Street, hosted a series of digital training workshops for 27 Marketing Manchester members in March. From sessions about getting a business visible on Google to more general creation of digital marketing plans, participants received advice and tips about SEO, content marketing, social media marketing and digital advertising as part of a bigger initiative to upskilling Greater Manchester’s tourism sector. Taking place in spring each year, English Tourism Week aims to raise the profile of the industry and celebrate the value and quality of tourism in England. Run in association with VisitEngland, the week is owned by the destinations, visitor attractions, accommodation providers, and stakeholders who make the industry the success that it is. The campaign provides a vehicle to kick-start the summer tourism season and promote local tourism products. To mark English Tourism Week in Manchester this year, Marketing Manchester undertook two pieces of activity that utilised social media. The first was an Instameet that took place on Saturday 23 March. Bringing together a group of 20 local Instagram stars, we got them to undertake a street art tour of Manchester’s Northern Quarter followed by the chance to have a go at creating their own piece of art with a spray can. The activity was tied into VisitEngland’s #MyMicrogap campaign, a national tourism campaign that promotes ways that young people can enjoy the richness of experiences and developmental opportunities offered on a conventional gap year – such as learning a new skill, supporting a good cause, discovering local flavours and meeting new people – without having to quit the day job, by ‘microgapping’ in the UK. To see highlights from the Manchester Instameet activity, please take a look at the Visit Manchester Instagram account and click on the ‘#MyMicrogap’ circle. The second activity was a straight-forward celebration of Greater Manchester’s tourism sector in which we encouraged arts and cultural organisations to cross promote each other on social media throughout English Tourism Week. Posting under the hashtag #ManchesterCultureSwap, the objective was to showcase alternative tourism attractions to each organisation’s followers and for them to be showcased in return, allowing all parties to tap into new audiences by exposing both sets of followers to attractions that they may not have been to before or want to revisit. Eleven partners took part in the #ManchesterCultureSwap and you see highlights from this activity by taking a look at the Visit Manchester Instagram account and clicking on the ‘#ManchesterCultureSwap’ circle. Distributed to consumer travel and leisure media contacts, Marketing Manchester’s monthly What’s New update is an important piece of media relations work to keep journalists and influencers from around the world up to date on the latest developments, openings and trends across the city-region. To view this month’s newsletter, click here.